Today is a sad day for Brontë lovers everywhere, as it marks the anniversary of the death of Charlotte Brontë, an event that occurred on 31st March 1855. Nevertheless, in her final year she did at last find some real happiness and inner peace, much to her surprise. When she married Arthur Bell Nicholls on June 29th 1854, after a long campaign of wooing that had at first seemed far from propitious, she professed little liking for him, but after the wedding she rapidly fell in love with him. It seems that she also rapidly fell pregnant; whilst never mentioned specifically by her in her correspondence of this time she does seek advice from people who have had babies, in guarded language that can be easily interpreted. 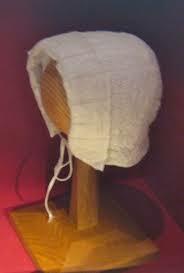 The Brontë Parsonage Museum also has a tiny, beautiful and moving baby bonnet that a friend had made for Charlotte in readiness for the impending happy event. It was never to occur. By 19th January 1855, Charlotte was confined to bed with nausea, but thought little of it, and she was making plans to visit Ellen Nussey at the end of January. Before that time however her condition had sharply deteriorated to the extent that she didn’t even have strength to write back to Ellen’s letters. Charlotte became unable to eat, until even the sight of food made her vomit. She was becoming increasingly thin and weak, but without today’s medical understanding of this condition doctors didn’t know how to treat what should have been an easily manageable condition. After two months of vomiting, inability to eat and continuous fatigue, the bed ridden Charlotte suddenly changed. She was now ravenous, and frequently delirious. It was too late, there was nothing to be done. 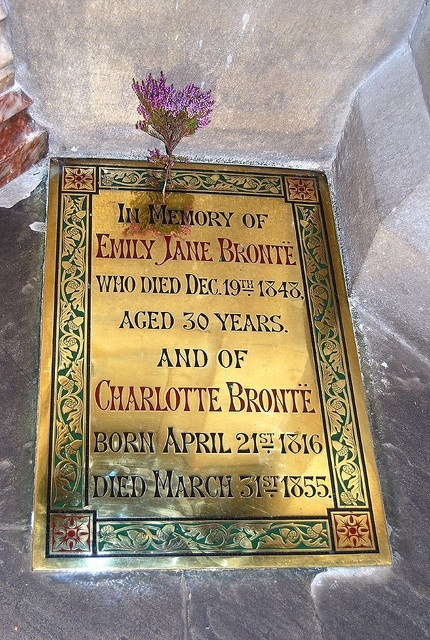 On 31st March 1855, Charlotte Brontë Nicholls died. 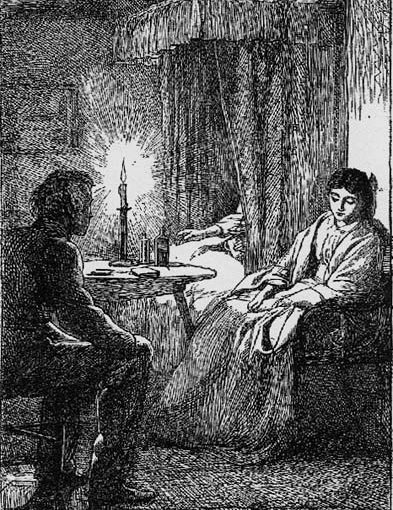 The Brontë line was now at an end forever, and her father Patrick had the unhappy fate of outliving them all. They are gone, and yet in a very real sense Charlotte, Emily, and Anne Brontë live on through their words, through their imagination, through their genius. Nick, you write so beautifully about the Bronte family. You’ve made us fall in love with all of them. How sad that Charlotte was robbed of happiness so soon. But they will live forever in their works! Nice story. Thanks for sharing. I, too, love everything Bronte. One of my all times favorite books is Jane Eyre. I read it often. And like Jane Austen, Bronte, Hardy, I marvel that these writers did not have computers to cut-paste and rearrange chapters, make corrections, have spell-check … the list goes on. Plus so limited with expensive paper to write on. Austen often used scraps. So, Bronte & Austen are my literary masters at their craft. I read them often and each time get new insights into the period they wrote in. Don’t care much for contemporary writers these days … I’m spoiled by the best that lived so long ago and in a country that bred the best writers of all time. I first heard of the Brontes when they were featured on “Blue Peter” (anyone else remember Valerie Singleton’s historical pieces?!). I was struck by their tragedy then and it has stayed with me all my life. I suppose it’s easy to say, if only she hadn’t married, but how can anyone really say that? Thanks for a wonderful blog, always very interesting. I read Jane eyre when at school and thought it a wonderful novel. I became interested in the Bronte sisters charlotte Emily and Anne as novelists. I always wanted to visit where they had lived in Haworth Yorkshire and enjoyed the visit.the story of the Bronte sisters and their struggle to get their books published in Victorian England and they had to use male pen names as women writers weren’t encouraged in those days. I think their story is one of triumph over adversary. They found inspiration from their lives in Haworth from where they wrote their stories. The tragic circumstances of their short lives is also what people are still interested in today and such talent in.one family. I agree Carole heath with your comment on.the brontes. They where early feminine writers who broke down the so called glass ceiling regarding women novelists. Previous Previous post: Who Were The Real Currer, Ellis and Acton Bell?